iPhone 4s or later. Requires iOS 7.1 or later. Compatible with iPhone, iPad, and iPod touch. Android 4.1 (Jelly Bean) and greater. Displays of less than 7 inches. Available for both Apple iOS or Android. Search the entire catalog of programs and events. Reserve or renew checked out items from your mobile device. Search the entier catalog of programs and events. Upgrades to various application components, including better map features and barcode scanner. New integration with the new "RBdigital" application for reading eMagazines and removing older dependencies to the discontinued "Zinio for Libraries" helper application. Removes confusion related to periodical requests. Contains maintenance fixes and patches to improve performance and user experience issues. 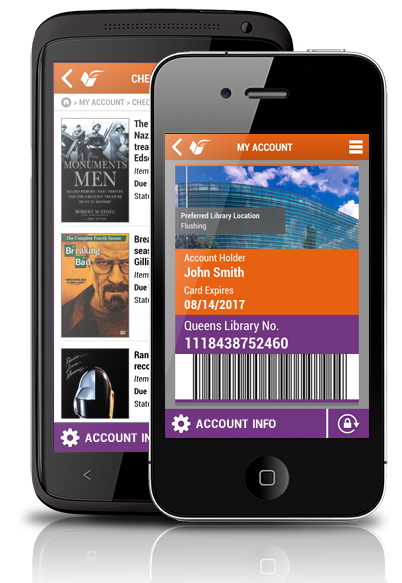 *Some features require Queens Library Card.